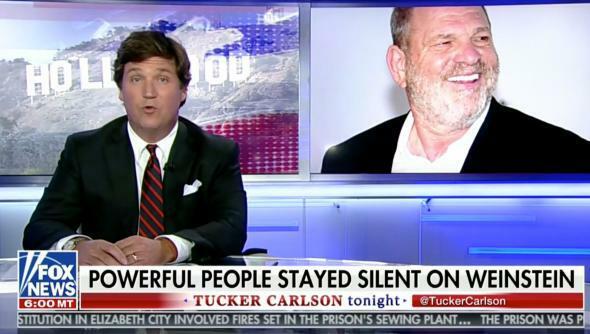 How Fox News is weaponizing the Harvey Weinstein scandal. The New York Times reported this weekend that, in January, former Fox News host Bill O’Reilly agreed to pay $32 million to settle a sexual harassment claim lodged against him by longtime Fox News guest Lis Wiehl. Concurrently, according to the Times, Rupert Murdoch and his sons Lachlan and James “made a business calculation to stand by Mr. O’Reilly despite his most recent, and potentially most explosive, harassment dispute.” In February, aware of the settlement, the Murdochs signed O’Reilly to a four-year contract extension worth $25 million per year. In April, after another Times story revealed numerous previous settlements dating as far back as 2002, Fox ousted O’Reilly. We have learned a remarkable amount from the Harvey Weinstein scandal so far. The most powerful man in Hollywood was a serial predator. The press assigned to cover him instead covered up for him. Self-appointed guardians of women looked the other way—in some cases, in exchange for cash. The corruption was total and complete. NBC’s role is especially shocking. The executives at NBC News knew exactly what Harvey Weinstein was doing nearly a year ago. And yet instead of reporting it they did their best to keep that information hidden from public view. There are many reasons why those with knowledge of Weinstein’s alleged predation may have chosen to keep quiet, but today that silence is easy to view as complicity. And so, too, is the Murdochs’ decision to extend O’Reilly’s contract while the host was simultaneously agreeing to pay a literal fortune to settle a harassment claim. This news makes it hard to stomach the distinct air of moral sanctimony that has suffused the network’s Weinstein coverage. It is one thing to throw rocks at rich celebrities for not speaking out against Harvey Weinstein; it is another thing entirely to do so from inside a house that was once made of glass but is now just shards of nondisclosure agreements. Tucker Carlson Tonight, of course, debuted in its current 8 p.m. time slot in April, as a replacement for The O’Reilly Factor. In his first program as O’Reilly’s replacement, on April 24, Carlson acknowledged his predecessor without mentioning the reasons for his abrupt departure. “What O’Reilly did was not easy,” Carlson said. “He set a high bar, and I’m gonna do my best to meet it.” To be fair, Carlson was surely trying to be gracious to the deposed host while simultaneously attempting to win over O’Reilly’s many viewers. But graciousness and self-interest often comprise the soil in which the seeds of complicity are planted. You had to know. The same logic could surely be used against Hannity, who has been at Fox since 1996, and who has seen colleague after colleague depart in the wake of sexual harassment scandals: not just the alleged harassers themselves like O’Reilly, Roger Ailes, and former host Eric Bolling, but the network’s numerous female ex-hosts, guests, and producers who claim to have been victimized by the aforementioned men and others. Did Hannity “have to know”? I couldn’t say. But on this specific issue, given his tenure and prominence at the network, the host has no reasonable claim to righteousness. It’s not that Fox News should be forbidden from reporting on Weinstein just because it has had its own harassment issues, of course. If that were the standard, very few media outlets would be able to report on Weinstein at all. But it would be easier to take Fox News’ reporting and commentary seriously—and it might even make it more powerful—if the network dispensed with the sanctimony and was open about its own sordid and very public history in this area. This rhetorical tactic is classic Fox News: accusing someone of hypocrisy as a means of disparaging all of their opinions on every topic. The ploy is logically bankrupt but rhetorically effective. And when it comes to the Harvey Weinstein story, this tack feels particularly inappropriate. The sexual exploitation of the vulnerable by the powerful is a problem endemic to society. It is found among the right and the left, the famous and the obscure. Framing the issue as a partisan one not only trivializes it, but also further exploits victims by using their suffering as fodder for petty political point scoring. “I lament the fact that we applaud the downfall of the person whose ideology is opposite ours and we put our head under the pillow when it happens to one of our own,” said Rivera on Hannity on Oct. 12. He’s seemingly among the few at Fox News who feels that way.